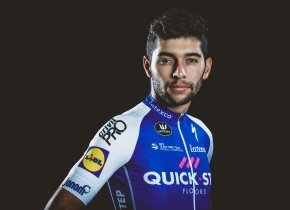 Fernando Gaviria (Quick-Step Floors) has won the last stage of the Tour of Guangxi. The Colombian took his fourth stage at the Chinese race by beating Niccolo Bonifazio and Dylan Groenewegen. The last stage of the last WorldTour race of the season was 168 kilometres long and started with an escape formed by Wang Meiyin (Bahrain-Merida), Jon Irisarri (Caja Rural-Seguros RGA) and Daniel Oss (BMC). This trio got an advantage of more than four minutes but was caught in the last ten kilometres. A sprint train formed by Remi Cavagna, Davie Martinelli, Pieter Serry, Martin Velits and Max Richeze took Gaviria to his last victory of the season. Bahrain-Merida's Niccolo Bonifazio, LottoNL-Jumbo's Dylan Groenewegen, Andrea Guardiani (UAE Team Emirates) and Magnus Cort Nielsen (Orica-Scott) completed the top five of the day. Lotto Soudal's Tim Wellens arrived with the pack and this was enough for him to take the overall victory. Bauke Mollema (Trek-Segafredo) and Nicolas Roche (BMC) occupied the second and third position on the podium, respectively.